James Madison, Jr. (March 16, 1751 – June 28, 1836) was an American statesman, political theorist and the fourth President of the United States (1809–1817). He is hailed as the "Father of the Constitution" for being instrumental in the drafting of the United States Constitution and as the key champion and author of the United States Bill of Rights. He served as a politician much of his adult life. In 1789, Madison became a leader in the new Democratic-Republican Party). As Jefferson's Secretary of State (1801–1809), Madison supervised the Louisiana Purchase, which doubled the nation's size. After his election to the presidency, he presided over renewed prosperity for several years. As president (1809–17), after the failure of diplomatic protests and a trade embargo against Great Britain, he led the nation into the War of 1812. He was responding to British encroachments on American honor and rights; in addition, he wanted to end the influence of the British among their Indian allies, whose resistance blocked United States settlement in the Midwest around the Great Lakes. Madison found the war to be an administrative nightmare, as the United States had neither a strong army nor financial system; as a result, he afterward supported a stronger national government and a strong military, as well as the national bank, which he had long opposed. Like other Virginia statesmen in the slave society, he was a slaveholder who inherited his plantation known as Montpelier, and owned hundreds of slaves during his lifetime to cultivate tobacco and other crops. Madison supported the Three-Fifths Compromise that allowed three-fifths of the enumerated population of slaves to be counted for representation. 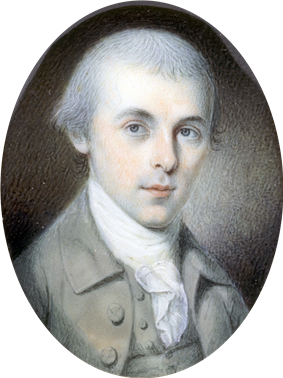 James Madison, Jr. was born at Belle Grove Plantation near Port Conway, Virginia on March 16, 1751, (March 5, 1751, Old Style, Julian calendar), where his mother had returned to her parents' home to give birth. He grew up as the oldest of twelve children. Nelly and James Sr. had seven more boys and four girls. Three of James Jr.'s brothers died as infants, including one who was stillborn. In the summer of 1775, his sister Elizabeth (age 7) and his brother Reuben (age 3) died in a dysentery epidemic that swept through Orange County because of contaminated water. His father, James Madison, Sr. (1723–1801), was a tobacco planter who grew up on a plantation, then called Mount Pleasant, in Orange County, Virginia, which he had inherited upon reaching adulthood. He later acquired more property and slaves; with 5,000 acres (2,000 ha), he became the largest landowner and a leading citizen of Orange County, in the Piedmont. James Jr.'s mother, Nelly Conway Madison (1731–1829), was born at Port Conway, the daughter of a prominent planter and tobacco merchant and his wife. Madison's parents were married on September 15, 1749. In these years the southern colonies were becoming a slave society, in which slave labor powered the economy and slaveholders formed the political élite. From ages 11 to 16, the young "Jemmy" Madison was sent to study under Donald Robertson, an instructor at the Innes plantation in King and Queen County, Virginia in the Tidewater region. Robertson was a Scottish teacher who tutored numerous prominent plantation families in the South. From Robertson, Madison learned mathematics, geography, and modern and ancient languages. He became especially proficient in Latin. Madison said that he owed his bent for learning "largely to that man (Robertson)." At age 16, he returned to Montpelier, where he began a two-year course of study under the Reverend Thomas Martin in preparation for college. Unlike most college-bound Virginians of his day, Madison did not choose the College of William and Mary, because the lowland climate of Williamsburg, where mosquitoes transmitted fevers and other infectious diseases during the summer, might have strained his delicate health. Instead, in 1769, he enrolled at the College of New Jersey, now Princeton University, where he became roommates and close friends with Philip Freneau, later dubbed "the poet of the Revolution." Indeed, Madison and Freneau would have become brothers-in-law had Freneau's favorite sister, Mary, accepted Madison's repeated proposals of marriage. But although Mary greatly admired and respected Madison, she had determined to stay single —one way a woman of her intelligence and accomplishments could hope to pursue her interests and remain independent in that era. Through diligence and long hours of study that may have damaged his health, Madison graduated in 1771. His studies included Latin, Greek, science, geography, mathematics, rhetoric, and philosophy. Great emphasis also was placed on speech and debate; Madison helped found the American Whig Society, in direct competition to fellow student Aaron Burr's Cliosophic Society. After graduation, Madison remained at Princeton to study Hebrew and political philosophy under the university president, John Witherspoon, before returning to Montpelier in the spring of 1772. He became quite fluent in Hebrew. Madison studied law from his interest in public policy, not with the intent of practicing law as a profession. At a height of only five feet, four inches (163 cm), and never weighing more than 100 pounds, he was the smallest president. Although educated by Presbyterian clergymen, young Madison was an avid reader of English deist tracts. Madison as an adult paid little attention to religious matters. Hutson says that historians searching through Madison's voluminous writings discover that after he left college, "there is no trace, no clue as to his personal religious convictions." However, some scholars say he leaned toward deism. After graduation from Princeton, young Madison took an increasing interest in the relationship between the American colonies and Britain, which deteriorated over the issue of British taxation. In 1774, Madison took a seat on the local Committee of Safety, a patriot pro-revolution group that oversaw the local militia. This was the first step in a life of public service that his family's wealth allowed him to pursue. In October 1775 he was commissioned as the colonel of the Orange County militia. He would not serve in combat as he was of very slight stature (5-4) and weighed only about 100 pounds. Congressman Madison, age 32 by Charles Willson Peale. As a young man during the American Revolutionary War, Madison served in the Virginia state legislature (1776–1779), where he became known as a protégé of the delegate Thomas Jefferson. He had earlier witnessed the persecution of Baptist preachers in Virginia, who were arrested for preaching without a license from the established Anglican Church. He worked with the Baptist preacher Elijah Craig on constitutional guarantees for religious liberty in Virginia. Working on such cases helped form his ideas about religious freedom, which he applied to the Constitution and Bill of Rights. Madison attained prominence in Virginia politics, working with Jefferson to draft the Virginia Statute for Religious Freedom, which was finally passed in 1786. It disestablished the Church of England and disclaimed any power of state compulsion in religious matters. He excluded Patrick Henry's plan to compel citizens to pay taxes that would go to a congregation of their choice. In 1777 Madison's cousin, the Right Reverend James Madison (1749–1812), became president of The College of William & Mary. Working closely with Madison and Jefferson, Bishop Madison helped lead the College through the changes involving separation from both Great Britain and the Church of England. He also led college and state actions that resulted in the formation of the new Episcopal Diocese of Virginia after the Revolution. As the youngest delegate to the Continental Congress (1780–1783), Madison was considered a legislative workhorse and a master of parliamentary coalition building. He persuaded Virginia to give up its claims to northwestern territories—consisting of most of modern-day Ohio and points west—to the Continental Congress. It created the Northwest Territory in 1783, as a federally supervised territory from which new states would be developed and admitted to the union. Virginia's land claims had partially overlapped with those of Connecticut, Pennsylvania and Maryland; they too ceded their westernmost lands to national authority, with the understanding that new states could be formed from the land. The Northwest Ordinance prohibited slavery in the new territory north of the Ohio River, but did not end it for those slaves held by settlers already in the territory. Madison was elected a second time to the Virginia House of Delegates, serving from 1784 to 1786 in the new years of independence. During these final years in the House of Delegates, Madison grew increasingly frustrated with what he saw as excessive democracy. He criticized the tendency for delegates to cater to the particular interests of their constituents, even if such interests were destructive to the state at large. In particular, he was troubled by a law that denied diplomatic immunity to ambassadors from other countries, and a law that legalized paper money. He thought legislators should be "disinterested" and act in the interests of their state at large, even if this contradicted the wishes of constituents. This "excessive democracy," Madison grew to believe, was the cause of a larger social decay which he and others (such as Washington) believed had resumed after the revolution and was nearing a tipping point. They were alarmed by Shays' Rebellion. The Articles of Confederation established the United States as a confederation of sovereign states with a weak central government. This arrangement did not work particularly well, and was even less successful after the war was over. Congress had no power to tax, and as a result was unable to pay debts left over from the Revolution. Madison and other nationalists, such as Washington and Alexander Hamilton, were very concerned about this. They feared a break-up of the union and national bankruptcy. The historian Gordon S. Wood has noted that many leaders such as Madison and Washington, feared more that the revolution had not fixed the social problems that had triggered it, and the excesses ascribed to the King were being seen in the state legislatures. Shays' Rebellion is often cited as the event that forced the issue; Wood argues that many at the time saw it as only the most extreme example of democratic excess. They believed the constitution would need to do more than fix the Articles of Confederation. Like the revolution, it would need to rewrite the social compact and redefine the relationship among the states, the national government, and the people. As Madison wrote, "a crisis had arrived which was to decide whether the American experiment was to be a blessing to the world, or to blast for ever the hopes which the republican cause had inspired." Partly at Madison's instigation, a national convention was called in 1787. Madison was crucial in persuading George Washington to attend the convention, since he knew how important the popular general would be to the adoption of a constitution. As one of the first delegates to arrive, while waiting for the convention to begin, Madison wrote what became known as the Virginia Plan. The Virginia Plan was submitted at the opening of the convention, and the work of the convention quickly became to amend the Virginia Plan and to fill in the gaps. Though the Virginia Plan was an outline rather than a draft of a possible constitution, and though it was extensively changed during the debate (especially by John Rutledge and James Wilson in the Committee of Detail), its use at the convention led many to call Madison the "Father of the Constitution". He was only 36 years old. During the course of the Convention, Madison spoke over two hundred times, and his fellow delegates rated him highly. For example, William Pierce wrote that "... every Person seems to acknowledge his greatness. In the management of every great question he evidently took the lead in the Convention ... he always comes forward as the best informed Man of any point in debate." Madison recorded the unofficial minutes of the convention, and these have become the only comprehensive record of what occurred. The historian Clinton Rossiter regarded Madison's performance as "a combination of learning, experience, purpose, and imagination that not even Adams or Jefferson could have equaled." Years earlier he had pored over crates of books that Jefferson sent him from France on various forms of government. The historian Douglas Adair called Madison's work "probably the most fruitful piece of scholarly research ever carried out by an American." Many have argued that this study helped prepare him for the convention. Gordon Wood, however, argues that Madison's frustrating experience in the Virginia legislature years earlier most shaped his constitutional views. Wood notes that the governmental structure in both the Virginia Plan and the final constitution were not innovative, since they were copied from the British government, had been used in the states since 1776, and numerous authors had already argued for their adoption at the national level. Most of what was controversial in the Virginia Plan was removed, and most of the rest had been commonly accepted as necessary for a functional government (state or national) for decades; thus, Madison's contribution was more qualitative. Wood argues that, like most national politicians of the late 1780s, Madison believed that the problem was less with the Articles of Confederation than with the nature of the state legislatures. He believed the solution was to restrain the excesses of the states. This required more than an alternation in the Articles of Confederation; it required a change in the character of the national compact. The ultimate question before the convention, Wood notes, was not how to design a government but whether the states should remain sovereign, whether sovereignty should be transferred to the national government, or whether the constitution should settle somewhere in between. Those, like Madison, who thought democracy in the state legislatures was excessive and insufficiently "disinterested", wanted sovereignty transferred to the national government, while those (like Patrick Henry) who did not think this a problem, wanted to fix the Articles of Confederation. Madison was one of the only delegates who wanted to deprive the states of sovereignty completely, which he considered the only solution to the problem. Though sharing the same goal as Madison, most other delegates reacted strongly against such an extreme change to the status quo. Though Madison lost most of his battles over how to amend the Virginia Plan (most importantly over the exclusion of the Council of Revision), in the process he increasingly shifted the debate away from a position of pure state sovereignty. Since most disagreements over what to include in the constitution were ultimately disputes over the balance of sovereignty between the states and national government, Madison's influence was critical. Wood notes that Madison's ultimate contribution was not in designing any particular constitutional framework, but in shifting the debate toward a compromise of "shared sovereignty" between the national and state governments. 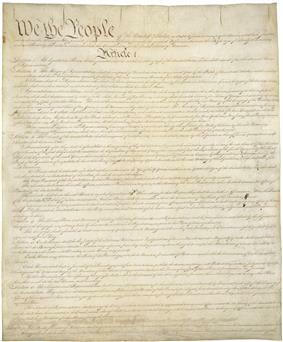 The Constitution developed by the convention in Philadelphia had to be ratified. This would be done by special conventions called in each state to decide that sole question of ratification. Madison was a leader in the ratification effort. He, Alexander Hamilton and John Jay wrote The Federalist Papers, a series of 85 newspaper articles published in New York to explain how the proposed Constitution would work, mainly by responding to criticisms from anti-federalists. They were also published in book form and became a virtual debater's handbook for the supporters of the Constitution in the ratifying conventions. The historian Clinton Rossiter called The Federalist Papers "the most important work in political science that ever has been written, or is likely ever to be written, in the United States." They were not scholarly arguments or impartial justifications for the constitution, but political polemics intended to assist the federalists in New York, which was the only state to have a coordinated anti-federalist movement. One reason Madison was involved in the project was because he was a delegate to the lame duck Confederation Congress, which was meeting in New York. If Virginia, the most populous state at the time, did not ratify the Constitution, the new national government would likely not succeed. When the Virginia convention began, the constitution had not yet been ratified by the required nine states. New York, the second largest state and a bastion of anti-federalism, would likely not ratify it if Virginia rejected the constitution, and Virginia's exclusion from the new government would disqualify George Washington from being the first president. Virginia delegates believed that Washington's election as the first president was an implicit condition for their acceptance of the new constitution and the new government. Without Virginia, a new convention might have been held and a new constitution written in a much more polarized atmosphere, since the constitution did not specify what would happen if it was only partially ratified. The states might have joined in regional confederacies or allied with Spain, France or Britain, which still had North American colonies. Arguably the most prominent anti-federalist, the powerful orator Patrick Henry was a delegate and had a following second only to Washington (who was not a delegate). Most delegates believed that most Virginians opposed the constitution. Initially Madison did not want to stand for election to the Virginia ratifying convention, but was persuaded to do so because the situation looked so bad. His role at the convention was likely critical to Virginia's ratification, and thus to the success of the constitution generally. As the states were leery of creating a powerful central government, the drive to achieve ratification was difficult. Patrick Henry feared that the constitution would trample on the independence of the states and the rights of citizens. In the Virginia ratifying convention, Madison, who was a terrible public speaker, had to go up against Henry, who was the finest orator in the country. Although Henry was by far the more powerful and dramatic speaker, Madison successfully matched him. While Henry's arguments were emotional appeals to possible unintended consequences, Madison responded with rational answers to these arguments; he eventually argued that Henry's claims were becoming absurd. Madison pointed out that a limited government would be created, and that the powers delegated "to the federal government are few and defined." Madison persuaded prominent figures such as Edmund Randolph, who had refused to endorse the constitution at the convention, to change their position and support it at the ratifying convention. Mason and Randolph's switch likely changed the votes of several more anti-federalists. When the vote was nearing, and the constitution still looked likely to be defeated, Madison pleaded with a small group of anti-federalists, and promised them he would push for a bill of rights later if they changed their votes. When the vote was held, the convention barely had sufficient votes to ratify, and these likely did not appear until the last minute. In terms of slavery and the Constitution, Madison viewed African American slaves as an "unfortunate race" and believed their true nature was both human and property. On February 12, 1788, Madison, in the Federalist Letter No. 54, stated that the Constitutional three-fifths compromise clause was the best alternative for the slaves current condition and for determining representation of citizens in Congress. Madison believed that slaves, as property, would be protected by both their masters and the government. Madison was called the "Father of the Constitution" by his peers in his own lifetime. However, he was modest, and he protested the title as being "a credit to which I have no claim. ... The Constitution was not, like the fabled Goddess of Wisdom, the offspring of a single brain. It ought to be regarded as the work of many heads and many hands". He wrote Hamilton at the New York ratifying convention, stating his opinion that "ratification was in toto and 'for ever'". Madison had been a delegate to the Confederation Congress, and wanted to be elected senator in the new government. A vengeful Patrick Henry wanted to deny Madison a seat in the new congress, so he ensured that Madison remained in the lame duck Confederation Congress to prevent him as long as possible from campaigning. Henry used his power to keep the Virginia legislature from appointing Madison as one of the state's senators. When Madison decided to run for election to the house instead, Henry gerrymandered Madison's home district, filling it with anti-federalists in an attempt to prevent Madison's election. Madison could have run in another district, so to prevent this, Henry forced through a law requiring congressmen to live in the district they represent. Later this was recognized as unconstitutional but, at the time, the law made it increasingly unlikely that Madison would be elected to congress. He ran against James Monroe, a future president, and traveled with Monroe while campaigning. Later as president, Madison was told by some of his former constituents that, had it not been for unusually bad weather on election day, Monroe likely would have won. Madison defeated Monroe and became an important leader in Congress. Though few in the new congress wanted to debate a possible Bill of Rights (for the next century, most thought that the Declaration of Independence, not the first ten constitutional amendments, constituted the true Bill of Rights), Madison pressed the issue. Congress was extremely busy with setting up the new government, most wanted to wait for the system to show its defects before amending the constitution, and the anti-federalist movements (which had demanded a new convention) had died out quickly once the constitution was ratified. Despite this, Madison still feared that the states would compel congress to call for a new constitutional convention, which they had the right to do. He also believed that the constitution did not sufficiently protect the national government from excessive democracy and parochialism (the defects he saw in the state governments), so he saw his amendments as a way to mitigate these problems. On June 8, 1789, Madison introduced his bill proposing amendments consisting of Nine Articles comprising up to 20 Amendments depending on how one counted. Madison initially proposed that the amendments would be incorporated into the body of the Constitution. The House passed most of his slate of amendments, but rejected the idea of placing the amendments in the body of the Constitution. Instead, it adopted 17 amendments to be attached separately and sent this bill to the Senate. The Senate condensed this slate to eleven amendments and removed the language that Madison had included to integrate them into the body of the constitution. The Senate also added what became the Ninth Amendment, which was not included in his original slate. To Madison's deep disappointment, it excluded a proposed amendment guaranteeing national sovereignty over the states. Some have argued that if this amendment had been included the American Civil War could have been avoided. 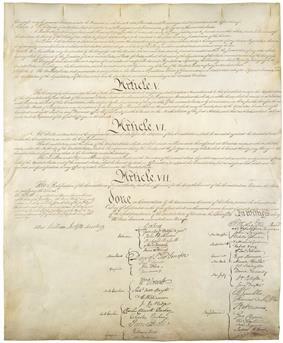 By 1791, the last ten of the proposed amendments were ratified and became the Bill of Rights. The Second Amendment originally proposed by Madison (but not then ratified) was later ratified in 1992 as the Twenty-seventh Amendment to the United States Constitution. The remaining proposal was intended to accommodate future increase in the members of the House of Representatives. When Britain and France went to war in 1793, the U.S. was caught in the middle. The 1778 treaty of alliance with France was still in effect, yet most of the new country's trade was with Britain. War with Britain seemed imminent in 1794, as the British seized hundreds of American ships that were trading with French colonies. Madison believed that Britain was weak and the United States was strong, and that a trade war with Britain, although risking a real war by the British government, probably would succeed, and would allow Americans to assert their independence fully. Great Britain, he charged, "has bound us in commercial manacles, and very nearly defeated the object of our independence." As Varg explains, Madison discounted the much more powerful British army and navy for "her interests can be wounded almost mortally, while ours are invulnerable." The British West Indies, Madison maintained, could not live without American foodstuffs, but Americans could easily do without British manufactures. This faith led him to the conclusion "that it is in our power, in a very short time, to supply all the tonnage necessary for our own commerce". However, George Washington avoided a trade war and instead secured friendly trade relations with Britain through the Jay Treaty of 1794. Madison threw his energies into fighting the Treaty—his mobilization of grassroots support helped form the First Party System. He failed in both the Senate and House, and the Jay Treaty led to ten years of prosperous trade with Britain (and anger on the part of France leading to the Quasi-War). All across the United States, voters divided for and against the Treaty and other key issues, and thus became either Federalists or Jeffersonian Republicans. Madison was elected to the U.S. House of Representatives with 57.37% of the vote, defeating James Monroe. Madison was re-elected with 97.79% of the vote, defeating Monroe. Supporters for ratification of the Constitution had become known as the Federalist Party. Those opposing the proposed constitution were labeled Anti-Federalists, but neither group was a political party in the modern sense. Following ratification of the Constitution and formation of the first government in 1789, two new political factions formed along similar lines as the old division. The supporters of Alexander Hamilton's attempts to strengthen the national government called themselves Federalists, while those who opposed Hamilton called themselves "Republicans" (later historians would refer to them as the Democratic-Republican party). Madison and Thomas Jefferson were the leaders of this second group. As first Secretary of the Treasury, Hamilton created many new federal institutions, including the Bank of the United States. Madison led the unsuccessful attempt in Congress to block Hamilton's proposal, arguing that the new Constitution did not explicitly allow the federal government to form a bank. As early as May 26, 1792, Hamilton complained, "Mr. Madison cooperating with Mr. Jefferson is at the head of a faction decidedly hostile to me and my administration." On May 5, 1792, Madison told Washington, "with respect to the spirit of party that was taking place ...I was sensible of its existence". He was elected a Fellow of the American Academy of Arts and Sciences in 1794. In 1798 under President John Adams, the U.S. and France unofficially went to war—the Quasi War, that involved naval warships and commercial vessels battling in the Caribbean. The Federalists created a standing army and passed laws against French refugees engaged in American politics and against Republican editors. Congressman Madison and Vice President Jefferson were outraged. Madison and Jefferson secretly drafted the Virginia and Kentucky Resolutions declaring the Alien and Sedition Acts to be unconstitutional and noted that "states, in contesting obnoxious laws, should 'interpose for arresting the progress of the evil.'" These turned out to be unpopular, even among republicans, since they called for state governments to invalidate federal laws. Jefferson went further, urging states to secede if necessary, though Madison convinced Jefferson to back down from this extreme view. According to Chernow, Madison's position "was a breathtaking evolution for a man who had pleaded at the Constitutional Convention that the federal government should possess a veto over state laws." Chernow feels that Madison's politics remained closely aligned with Jefferson's until his experience as president with a weak national government during the War of 1812 caused Madison to appreciate the need for a strong central government to aid national defense. At the time, he began to support a national bank, a stronger navy, and a standing army. The historian Gordon S. Wood says that Lance Banning, as in his Sacred Fire of Liberty (1995), is the "only present-day scholar to maintain that Madison did not change his views in the 1790s." To reach that conclusion, Banning downplays Madison's nationalism in the 1780s. Wood notes that many historians struggle to understand Madison, but he looks at him within his own times—as a nationalist but one with a different conception of what that meant than the Federalists. He wanted to avoid a European-style government and always thought that the embargo would ultimately have been successful. thus, Wood assesses Madison from a different point of view. Gary Rosen and Banning use other approaches to suggest Madison's consistency. Madison was 43 when he married for the first time, which was considered late in that era. On September 15, 1794, James Madison married Dolley Payne Todd, a 26 year old widow, at Harewood, in what is now Jefferson County, West Virginia. Madison had no children but did adopt Todd's one surviving son, John Payne Todd (known as Payne), after the marriage. Dolley Payne was born May 20, 1768, at the New Garden Aaron Burr to arrange a meeting. By August, she had accepted his proposal of marriage. For marrying Madison, a non-Quaker, she was expelled from the Society of Friends. They were known to have a happy marriage. Dolley Madison put her social gifts to use when the couple lived in Washington, beginning when he was Secretary of State. With the White House still under construction, she advised as to its furnishings and sometimes served as First Lady for ceremonial functions for President Thomas Jefferson, a widower and their friend. When her husband was president, she created the role of First Lady, using her social talents to advance his program. She is credited with adding to his popularity in office. Madison's father died in 1801 and at age 50, Madison inherited the large plantation of Montpelier and other holdings, and his father's 108 slaves. He had begun to act as a steward of his father's properties by 1780, but this completed his takeover. When Thomas Jefferson was inaugurated as president in 1801, he named Madison to be his secretary of state. At the start of his term, Madison was a party to the United States Supreme Court case Marbury v. Madison (1803), in which the doctrine of judicial review was asserted by the high Court, much to the annoyance of the Jeffersonians who did not want a powerful federalist judiciary. The main challenge to the Jefferson Administration was maintaining neutrality during the Napoleonic Wars. Throughout Jefferson's presidency, much of Europe was at war, at first between France and Austria. After the Battle of Austerlitz in 1805, where France decisively defeated the Austrian Habsburgs, the conflict transformed into a grinding war between France and Britain. Shortly before Jefferson's election, Napoleon had seized power from the hapless French Directory, which had recently mismanaged France's finances in unsuccessful wars and had lost control of Saint-Domingue (Haiti) after a slave rebellion. Beginning in 1802, Napoleon sent more than 20,000 troops to try to restore slavery on the island, as its colonial sugar cane plantations had been the chief revenue producer for France in the New World. The warfare went badly and the troops were further decimated by yellow fever. Napoleon gave up on thoughts of restoring the empire and sold the Louisiana territory to Madison and Jefferson in 1803. Later that year, the 7,000 surviving French troops were withdrawn from the island, and in 1804 Haiti declared its independence as the second republic in the western hemisphere. Many contemporaries and later historians, such as Ron Chernow, noted that Madison and President Jefferson ignored their "strict construction" view of the Constitution to take advantage of the purchase opportunity. 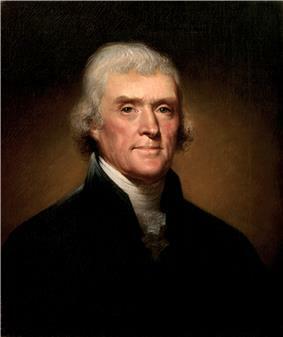 Jefferson would have preferred to have a constitutional amendment authorizing the purchase, but did not have time nor was he required to do so. 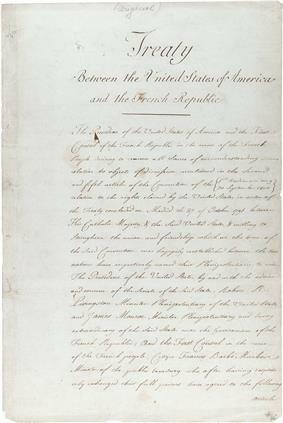 The Senate quickly ratified the treaty that completed the purchase. The House, with equal alacrity, passed enabling legislation. With the wars raging in Europe, Madison tried to maintain American neutrality, and insisted on the legal rights of the U.S. as a neutral under international law. Neither London nor Paris showed much respect, however, and the situation deteriorated during Jefferson's second term. After Napoleon achieved victory at Austerlitz over his enemies in continental Europe, he became more aggressive and tried to starve Britain into submission with an embargo that was economically ruinous to both sides. Madison and Jefferson had also decided on an embargo to punish Britain and France, which forbade American trade with any foreign nation. The embargo failed in the United States just as it did in France, and caused massive hardships up and down the seaboard, which depended on foreign trade. The Federalists made a comeback in the Northeast by attacking the embargo, which was allowed to expire just as Jefferson was leaving office. With Jefferson's second term winding down, and his decision to retire widely known, Madison was the party choice for president in 1808. He was opposed by Rep. John Randolph, who had broken earlier with Jefferson and Madison. 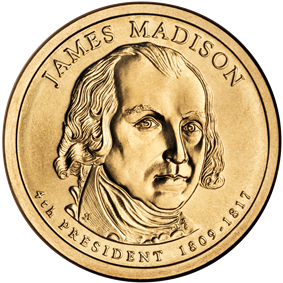 The Republican Party Congressional caucus chose the candidate and easily selected Madison over James Monroe. As the Federalist party by this time had largely collapsed outside New England, Madison easily defeated Federalist Charles Cotesworth Pinckney. Upon his Inauguration in 1809, Madison immediately had difficulty in his appointment selection of Sec. Albert Gallatin as Secretary of State. Under opposition from Sen. William B. Giles, Madison chose not to fight Congress for the nomination but kept Sec. Gallatin, a carry over from the Jefferson Administration, in the Treasury. The talented Swiss born Gallatin was Madison's primary advisor, confidant, and policy planner. Madison appointed Robert Smith for Secretary of State, Jefferson's former Secretary of Navy. For his Secretary of Navy, Madison appointed Paul Hamilton. Madison's Cabinet, that included men of mediocre talent, was chosen in terms of national interest and political harmony. 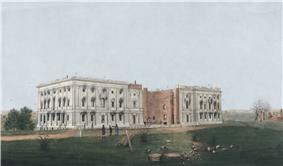 When Madison assumed office in 1809, the federal government had a surplus of $9,500,000 and by 1810 the national debt continued to be reduced and taxes had been cut. Madison sought to continue Jefferson's agenda, in particular the dismantling of the system left behind by the federalists under Washington and Adams. One of the most pressing issues Madison confronted was the first Bank of the United States. 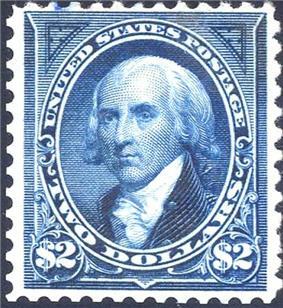 Its twenty-year charter was scheduled to expire in 1811, and while Madison's treasury secretary said the bank was a necessity, Congress failed to re-authorize it. As the absence of a national bank made war with Britain very difficult to finance, in 1814 Congress passed a bill chartering a second national bank. Madison vetoed it. In 1816, Congress passed another bill to charter a second national bank; Madison signed the act, having learned the bank was needed from the war with Britain. By 1809 the Federalist party was no longer competitive outside a few strongholds. Some former members (such as John Quincy Adams, Madison's ambassador to Russia) had joined Madison's Republican party. Though one party appeared to dominate, it had begun to split into rival factions, which would later form the basis of the modern party system. In particular, with hostilities against Britain appearing increasingly likely, factions in favor of and against war with Britain formed in Congress. The predominant faction, the "War Hawks," were led by House Speaker Henry Clay. When war finally did break out, the war effort was led by the War Hawks in Congress under Clay at least as much as it was by Madison; this accorded with the president's preference for checks and balances. After Jackson accused Madison of duplicity with Erskine, Madison had Jackson barred from the State Department and sent packing to Boston. 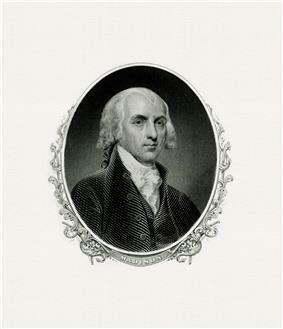 Madison during his first state of the Union address in November 1809, asked Congress for advice and alternatives concerning British-American trade crisis and to prepare for war. By Spring 1810, Madison was specifically asking Congress for more appropriations to increase the Army and Navy in preparation for war with Britain. Together with the effects of European peace, the United States economy began to recover early in Madison's presidency. By the time Madison was standing for reelection, the Peninsular War in Spain had spread, while at the same time Napoleon invaded Russia, and the entire European continent was once again embroiled in war. The United States entered the War of 1812, which in many respects was a theater of the broader Napoleonic Wars. Napoleon began his Continental System, intended to force other European countries to join his embargo of Britain. Although he was initially successful in starving out Britain, Portugal refused to capitulate, leading to the Peninsular War throughout Spain. This loosened Spain's grip on its South American colonies. Great Britain became the only major power in the Atlantic, and as it increased naval pressure against Napoleon, it inadvertently did the same against American ships. British tactics quickly caused widespread American anger. Britain used its navy to prevent American ships from trading with France. The United States, which was a neutral nation, considered this act to be against international law. Britain also armed Indian tribes in the Northwest Territory and encouraged them to attack settlers, even though Britain had ceded this territory to the United States by treaties in 1783 and 1794. The Royal Navy boarded American ships on the high seas and impressed its seamen, as it needed more sailors than it could recruit. The United States looked upon this as no less an affront to American sovereignty than if the British had invaded American soil. Americans called for a "second war of independence" to restore honor and stature to the new nation. An angry public elected a "war hawk" Congress, led by Henry Clay and John C. Calhoun. 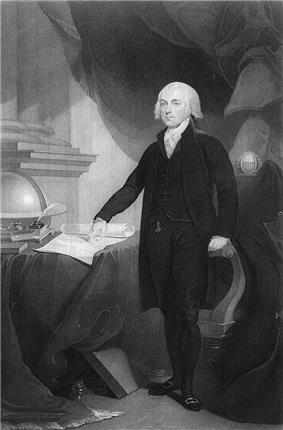 Madison asked Congress for a declaration of war, which was passed along sectional and party lines, with intense opposition from the Federalists and the Northeast, where the economy had suffered during Jefferson's trade embargo. Hurriedly Madison called on Congress to put the country "into an armor and an attitude demanded by the crisis," specifically recommending enlarging the army, preparing the militia, finishing the military academy, stockpiling munitions, and expanding the navy. Madison faced formidable obstacles—a divided cabinet, a factious party, a recalcitrant Congress, obstructionist governors, and incompetent generals, together with militia who refused to fight outside their states. Most serious was lack of unified popular support. There were serious threats of disunion from New England, which engaged in extensive smuggling with Canada and refused to provide financial support or soldiers. The problems were worse due to Jefferson's and Madison's dismantling of the system built by Hamilton and the Federalists. They had reduced the military, closed the Bank of the U.S., and narrowed the tax system. They distrusted standing armies and banks, and the dismantling of the federalist taxation system meant they could not finance the quick hiring of mercenaries. By the time the war began, Madison's military force consisted mostly of poorly trained militia members. 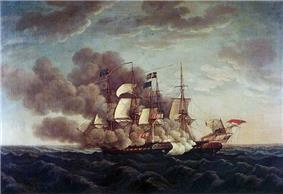 The USS Constitution defeats HMS Guerriere, a significant event during the war. The senior command at the War Department and in the field proved incompetent or cowardly—the general at Detroit surrendered to a smaller British force without firing a shot. Gallatin at the Treasury discovered the war was almost impossible to fund, since the national bank had been closed and major financiers in the Northeast refused to help. Madison believed the U.S. could easily seize Canada and thus cut off food supplies to the West Indies, making for a good bargaining chip at the peace talks. But the US invasion efforts all failed. Madison had believed the state militias would rally to the flag and invade Canada, but the governors in the Northeast failed to cooperate. Their militias either sat out the war or refused to leave their respective states for action. The British armed American Indians in the Northwest, most notably several tribes allied with the Shawnee chief, Tecumseh. 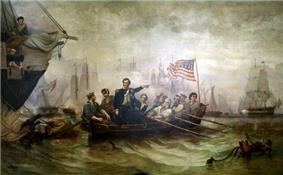 But, after losing control of Lake Erie at the naval Battle of Lake Erie in 1813, the British were forced to retreat. General William Henry Harrison caught up with them at the Battle of the Thames, where he destroyed the British and Indian armies, killed Tecumseh, and permanently destroyed Indian power in the Great Lakes region. The British raided Washington in 1814, as Madison headed a dispirited militia. Dolley Madison rescued White House valuables and documents shortly before the British burned the White House, the Capitol and other public buildings. By 1814, Andrew Jackson and William Henry Harrison had destroyed the main Indian threats in the South and West, respectively. As part of the war effort, an American naval shipyard was built up at Sackets Harbor, New York, where thousands of men produced twelve warships and had another nearly ready by the end of the war. American frigates and other vessels, such as the USS Constitution, USS United States, USS Chesapeake, USS Hornet, USS Wasp, and USS Essex, won some significant naval battles on the Great Lakes. In a famous three-hour battle with the HMS Java, the USS Constitution earned her nickname, "Old Ironsides." The U.S. fleet on Lake Erie went up against a superior British force there and destroyed or captured the entire British Fleet on the lake. Commander Oliver Hazard Perry reported his victory with the simple statement, "We have met the enemy, and they are ours." America had built up one of the largest merchant fleets in the world, though it had been partially dismantled under Jefferson and Madison. Madison authorized many of these ships to become privateers in the war. Armed, they captured 1,800 British ships. 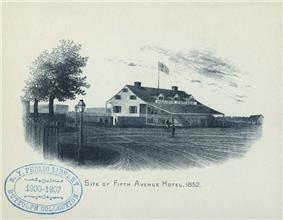 The courageous, successful defense of Ft. McHenry, which guarded the seaway to Baltimore, against one of the most intense naval bombardments in history (over 24 hours), led Francis Scott Key to write the poem that was set to music as the U.S. national anthem, "The Star Spangled Banner." In New Orleans, Gen. Andrew Jackson put together a force including regular Army troops, militia, frontiersmen, Creoles, Native American allies and Jean Lafitte's pirates. The Battle of New Orleans took place two weeks after peace treaty was drafted (but before it was ratified, so the war was not over). The Americans smashed the British invasion army in the greatest victory of the war. The Treaty of Ghent ended the war in February 1815, with no territorial gains on either side. The Americans felt that their national honor had been restored in what has been called "the Second War of American Independence." On March 3, 1815, the U.S. Congress authorized deployment of naval power against Algiers, and two squadrons were assembled and readied for war; the Second Barbary War would mark the beginning of the end for piracy in that region. To most Americans, the quick succession of events at the end of the war (the burning of the capital, the Battle of New Orleans, and the Treaty of Ghent) appeared as though American valor at New Orleans had forced the British to surrender after almost winning. This view, while inaccurate, strongly contributed to the post-war euphoria that persisted for a decade. It also helps explain the significance of the war, even if it was strategically inconclusive. Napoleon was defeated for the last time at the Battle of Waterloo near the end of Madison's presidency, and as the Napoleonic Wars ended, so did the War of 1812. Madison's final years began an unprecedented period of peace and prosperity, which was called the Era of Good Feelings. Madison's reputation as President improved and Americans finally believed the United States had established itself as a world power. Having considered the bill ... I am constrained by the insuperable difficulty I feel in reconciling this bill with the Constitution of the United States.... The legislative powers vested in Congress are specified ... in the ... Constitution, and it does not appear that the power proposed to be exercised by the bill is among the enumerated powers. Madison urged a variety of measures that he felt were "best executed under the national authority," including federal support for roads and canals that would "bind more closely together the various parts of our extended confederacy." 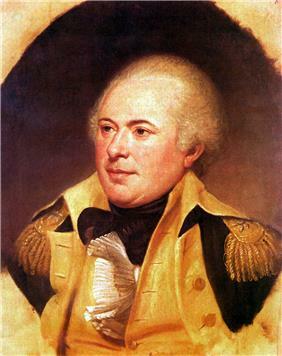 James Wilkinson was a controversial U.S. military commander and appointed governor of the Louisiana Territory by Thomas Jefferson in 1805. Wilkinson had earlier been implicated in Aaron Burr's conspiracy to form a new nation in the West and taking Spanish gold, however, he was exonerated in 1808. Jefferson chose to retain Wilkinson, a Republican, for political expedience. After Madison assumed the Presidency in 1809, he placed Wilkinson in charge of Terre aux Boeufs on the Louisiana coast to protect the U.S. from invasion. Wilkinson proved to be an incompetent general; many soldiers complained that he was ineffectual: their tents were defective, and they became sick by malaria, dysentery, and scurvy; dozens died daily. Wilkinson made excuses and refused to move inland from the mosquito-infested coastline. A two-year congressional investigation into the Wilkinson matter proved to be inconclusive, and Madison had to decide whether to keep or sack him. Like Jefferson, Madison chose to retain Wilkinson for political reasons, as Wilkinson had influence as a Pennsylvania Republican. By retaining Wilkinson, both Jefferson and Madison supported military leaders in both the Army and Navy for political reasons rather than competence. Historian Robert Allen Rutland stated the Wilkinson affair left "scars on the War Department" and "left Madison surrounded by senior military incompetents ..." at the beginning of the War of 1812. After Wilkinson's two battle defeats by the British, Madison relieved the officer from active military service. Creek men being taught how to use a plow by Benjamin Hawkins in 1805. 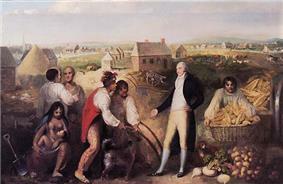 Madison believed learning European-style agriculture would help the Creek adopt the values of British-American civilization. 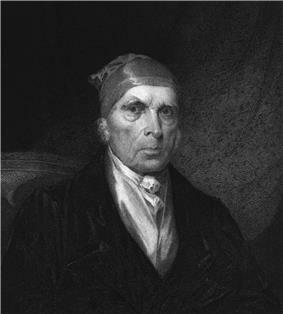 Upon assuming office on March 4, 1809 James Madison, in his first Inaugural Address to the nation, stated that the federal government's duty was to convert the American Indians by the "participation of the improvements of which the human mind and manners are susceptible in a civilized state". Like Jefferson, Madison had a paternalistic attitude toward American Indians, encouraging the men to give up hunting and become farmers. Although there are scant details, Madison often met with Southeastern and Western Indians who included the Creek and Osage. As pioneers and settlers moved West into large tracts of Cherokee, Choctaw, Creek, and Chickasaw territory, Madison ordered the US Army to protect Native lands from intrusion by settlers, to the chagrin of his military commander Andrew Jackson. Jackson wanted the President to ignore Indian pleas to stop the invasion of their lands and resisted carrying out the president's order. In the Northwest Territory after the Battle of Tippecanoe in 1811, Indians were pushed off their tribal lands and replaced entirely by white settlers. By 1815, with a population of 400,000 European-American settlers in Ohio, Indian rights to their lands had effectively become null and void. BEP engraved portrait of Madison as President. Madison is the only president to have had two vice-presidents die while in office. When Madison left office in 1817, he retired to Montpelier, his tobacco plantation in Orange County, Virginia, not far from Jefferson's Monticello. He was 65 years old. Dolley, who thought they would finally have a chance to travel to Paris, was 49. As with both Washington and Jefferson, Madison left the presidency a poorer man than when he entered, due to the steady financial collapse of his plantation, aided by the continued low price of tobacco and his stepson's mismanagement. Insight into Madison is provided by the first "White House memoir," A Colored Man's Reminiscences of James Madison (1865), told by his former slave Paul Jennings, who served the president from the age of 10 as a footman, and later as a valet for the rest of Madison's life. After Madison's death, Jennings was purchased in 1845 from Dolley Madison by arrangement with the senator Daniel Webster, who enabled him to work off the cost and gain his freedom. Jennings published his short account in 1865. He had the highest respect for Madison and said he never struck a slave, nor permitted an overseer to do so. Jennings said that if a slave misbehaved, Madison would meet with the person privately to try to talk about the behavior. Some historians speculate that Madison's mounting debt was one of the chief reasons why he refused to allow his notes on the Constitutional Convention, or its official records which he possessed, to be published in his lifetime. "He knew the value of his notes, and wanted them to bring money to his estate for Dolley's use as his plantation failed—he was hoping for one hundred thousand dollars from the sale of his papers, of which the notes were the gem." Madison's financial troubles weighed on him, and deteriorating mental and physical health would haunt him. In his later years, Madison became extremely concerned about his historic legacy. He took to modifying letters and other documents in his possession: changing days and dates, adding and deleting words and sentences, and shifting characters. By the time he had reached his late seventies, this "straightening out" had become almost an obsession. As an example, he edited a letter written to Jefferson criticizing Lafayette: Madison not only inked out original passages, but imitated Jefferson's handwriting as well in making changes. "During the final six years of his life, amid a sea of personal [financial] troubles that were threatening to engulf him...At times mental agitation issued in physical collapse. For the better part of a year in 1831 and 1832 he was bedridden, if not silenced... Literally sick with anxiety, he began to despair of his ability to make himself understood by his fellow citizens." In 1826, after the death of Jefferson, Madison was appointed as the second Rector ("President") of the University of Virginia. He retained the position as college chancellor for ten years until his death in 1836. In 1829, at the age of 78, Madison was chosen as a representative to the constitutional convention in Richmond for the revising of the Virginia state constitution. It was his last appearance as a legislator and constitutional drafter. The issue of greatest importance at this convention was apportionment. The western districts of Virginia complained that they were underrepresented because the state constitution apportioned voting districts by county, not population. The growing population in the Piedmont and western parts of the state were not reflected in their representation in the legislature. Western reformers also wanted to extend suffrage to all white men, in place of the historic property requirement. Madison tried to effect a compromise, but to no avail. Eventually, suffrage rights were extended to renters as well as landowners, but the eastern planters refused to adopt population apportionment. Madison was disappointed at the failure of Virginians to resolve the issue more equitably. Madison was very concerned about the continuing issue of slavery in Virginia and the South. He believed that transportation of free American blacks to Africa offered a solution, as promoted by the American Colonization Society (ACS). He told Lafayette at the time of the convention that colonization would create a "rapid erasure of the blot on our Republican character." The British sociologist, Harriet Martineau, visited with Madison during her tour of the United States in 1834. She characterized his faith in colonization as the solution to slavery as "bizarre and incongruous." Madison may have sold or donated his gristmill in support of the ACS. The historian Drew R. McCoy believes that "The Convention of 1829, we might say, pushed Madison steadily to the brink of self-delusion, if not despair. The dilemma of slavery undid him." Like most African Americans of the time, Madison's slaves wanted to remain in the U.S. where they had been born and believed their work earned them citizenship; they resisted "repatriation". Through failing health, Madison wrote several memoranda on political subjects, including an essay against the appointment of chaplains for Congress and the armed forces. He felt it would produce religious exclusion but not political harmony. 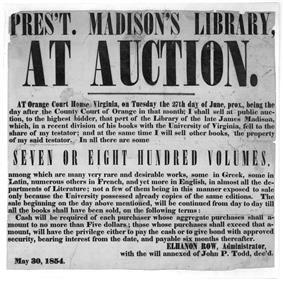 Between 1834 and 1835, Madison sold 25% of his slaves to make up for financial losses on his plantation. Madison lived until 1836, increasingly ignored by the new leaders of the American polity. He died at Montpelier on June 28, as the last of the Founding Fathers. He was buried in the Madison Family Cemetery at Montpelier. In 1842, Dolley Madison sold the Montpelier mansion, and in 1844 sold the extensive plantation lands to Henry W. Moncure. She leased half of the remaining slaves to Moncure. The other half were inherited by her, her son John Payne Todd, and James Madison, Jr., a nephew. Between 1845 and 1849 Todd sold numerous slaves; by 1851 he retained only 15 at his residence. By 1850, the Montpelier plantation was a "ghost of its former self". In 1851, Montpelier was owned by Thomas Thorton, an Englishman; he held 40 slaves. Madison's claim on our admiration does not rest on a perfect consistency, any more than it rests on his presidency. He has other virtues. ... As a framer and defender of the Constitution he had no peer. ... The finest part of Madison's performance as president was his concern for the preserving of the Constitution. ... No man could do everything for the country—not even Washington. Madison did more than most, and did some things better than any. That was quite enough. It is of great importance in a republic not only to guard the society against the oppression of its rulers, but to guard one part of the society against the injustice of the other part... In a society under the forms of which the stronger faction can readily unite and oppress the weaker, anarchy may as truly be said to reign as in a state of nature, where the weaker individual is not secured against the violence of the stronger. In 1986, Congress created the James Madison Memorial Fellowship Foundation as part of the bicentennial celebration of the Constitution. The Foundation offers $24,000 graduate level fellowships to secondary teachers to undertake a master’s degree which emphasizes the study of the Constitution. 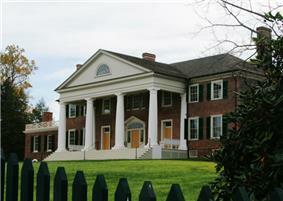 Montpelier, his family's plantation and his home in Orange, Virginia, has been designated a National Historic Landmark. 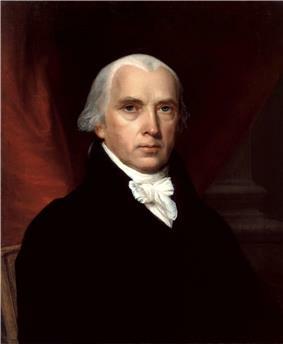 Named in his honor were the James Madison College of public policy at Michigan State University; and James Madison University in Harrisonburg, Virginia; the James Madison Institute honors his contributions to the Constitution. The Madison Range was named in honor of the then U.S. Secretary of State by Meriwether Lewis as the Lewis and Clark Expedition traveled through Montana in 1805. The Madison River in southwestern Montana, was named in 1805 by Lewis & Clark. Mount Madison in the Presidential Range of the White Mountains in New Hampshire is named for him. Two U.S. Navy ships have been named USS James Madison and three as USS Madison. 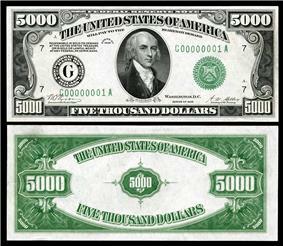 Madison's portrait was on the U.S. $5000 bill. Madison Cottage in New York City was named in his honor shortly after his death. It later became the well-known Madison Square. ^ a b Wood, 2006b. ^ a b c d Chapman, C. Thomas (May 22, 2006). "Descendants of Ambrose Madison, the Grandfather of President James Madison, Jr". The National Society of Madison Family Descendants. pp. 1–20. Retrieved October 25, 2011. ^ a b c "The Madison Cemetery". James Madison's Montpelier. 2011. Retrieved October 25, 2011. ^ Boyd-Rush, Dorothy. "Molding a founding father". James Madison University. Retrieved 25 March 2013. ^ "James Madison's Biography". The Montpelier Foundation. Retrieved 25 March 2013. ^ Brennan, Daniel. "Did James Madison suffer a nervous collapse due to the intensity of his studies?" Mudd Manuscript Library Blog, January 2008, Princeton University Archives and Public Policy Papers Collection, Princeton University. ^ Ketcham, Ralph, James Madison: A Biography, p. 56, Newtown, Connecticut: American Political Biography Press, 1971. ^ Noah McCullough (2006). The Essential Book of Presidential Trivia. Random House Digital, Inc. p. 21. ^ Peter Charles Hoffer (2006). The Brave New World: A History of Early America. Johns Hopkins U.P. p. 363. ^ James H. Hutson (2003). Forgotten Features of the Founding: The Recovery of Religious Themes in the Early American Republic. Lexington Books. p. 156. ^ Bruce Miroff et al. (2011). Debating Democracy: A Reader in American Politics. Cengage Learning. p. 149. ^ Michael Corbett (2013). Politics and Religion in the United States. Routledge. p. 78. ^ "James Madison Biography", American-Presidents.com, Retrieved July 29, 2009. ^ a b Wood, Gordon. "The Idea of America". p. 104. ^ Robert Allen Rutland (1997). James Madison: The Founding Father. University of Missouri Press. p. 14. ^ Wills, Garry, James Madison, pp. 26–27, New York: Henry Holt & Co., 2002. ^ a b c d Wood, Gordon. "The Idea of America". p. 183. ^ Bernstein, Richard B., Are We to be a Nation? p. 199, Harvard University Press, Cambridge, MA, 1987. ^ Rossiter, Clinton, ed., The Federalist Papers, p. xiii, Penguin Putnam, Inc., New York, NY, 1961. ^ Rossiter, Clinton, ed., The Federalist Papers, p. ix, Penguin Putnam, Inc., New York, NY, 1961. ^ a b c Labunski, Richard, James Madison and the Struggle for the Bill of Rights, p. 82. ^ Labunski, Richard, James Madison and the Struggle for the Bill of Rights, p. 3. ^ Rutland, Robert Allen, James Madison: The Founding Father, pp. 36–39, University of Missouri Press, Columbia, MO, 1987. ^ Samples, John, James Madison and the Future of Limited Government, pp. 25–42, Cato Institute, Washington, D.C., 2002. ^ a b Labunski, Richard, James Madison and the Struggle for the Bill of Rights, pp. 135. ^ Labunski, Richard, James Madison and the Struggle for the Bill of Rights, pp. 148–50, Oxford University Press, New York, NY, 2006. ^ Labunski, Richard, James Madison and the Struggle for the Bill of Rights, pp. 195–97, Oxford University Press, New York, NY, 2006. ^ "A Century of Lawmaking for a New Nation: U.S. Congressional Documents and Debates, 1774–1875, Annals of Congress, House of Representatives, 1st Congress, 1st Session". The Library of Congress. Retrieved August 7, 2012. ^ Hamilton, Writings (Library of America, 2001), p. 738. ^ Madison Letters 1 (1865), p. 554. ^ "Book of Members, 1780–2010: Chapter M". American Academy of Arts and Sciences. Retrieved July 28, 2014. ^ New York: Penguin, 2004, p. 573Alexander Hamilton,Chernow, Ron. ^ Chernow. Alexander Hamilton p. 571. ^ Chernow. Alexander Hamilton pp. 573–74. ^ Rosen, Gary, American Compact: James Madison and the Problem of the Founding, pp. 2–4, 6–9, 140–75, University Press of Kansas, Lawrence, KS, 1999. ^ Banning, Lance, The Sacred Fire of Liberty: James Madison and the Founding of the Federal Republic, pp. 7–9, 161, 165, 167, 228–31, 296–98, 326–27, 330–33, 345–46, 359–61, 371, Cornell University Press, Ithaca, NY, 1995. ^ Banning, Lance, Jefferson and Madison: Three Conversations from the Founding, pp. 78–79, Madison House, Madison, WI, 1995. ^ a b c d e Rutland (1990), pp. 32–33. ^ Rosen, Gary, American Compact: James Madison and the Problem of Founding, p. 171, Lawrence, Kansas: University Press of Kansas, 1999. ^ Rosen, Gary, American Compact: James Madison and the Problem of Founding, pp. 171-3, University Press of Kansas, Lawrence, KS, 1999. ^ Peterson, Merrill D., ed., James Madison: A Biography in His Own Words, Vol. 2, pp. 356–59, New York: Newsweek, 1974. ^ Rutland (1990), p. 55. ^ Rutland (1990), pp. 40–44. ^ Madison, James (1865). Letters and other Writings of James Madison. Volume IV. 1829–1836. Philadelphia: J. B. LIPPINCOTT & CO. pp. 491–92. ^ Rutland (1990), pp. 44–45. ^ "Dolley Madison," Montpelier Web site (http://montpelier.org/explore/dolley_madison/index.php , retrieved 6-5-11. ^ Toll, Ian W., Six Frigates: The Epic History of the Founding of the U.S. Navy, pp. 360–65, W. W. Norton, New York, NY, 2006. ^ Rowen, Bob, "American Privateers in the War of 1812," paper presented to the New York Military Affairs Symposium, Graduate Center of the City University of New York, 2001, revised for Web publication, 2006-8 (http://nymas.org/warof1812paper/paperrevised2006.html , retrieved 6-6-11. ^ "The Star-Spangled Banner and the War of 1812," Encyclopedia Smithsonian (http://www.si.edu/Encyclopedia_SI/nmah/starflag.htm , retrieved 3-10-08. ^ Reilly, Robin, The British at the Gates: The New Orleans Campaign in the War of 1812, 1974. ^ "Second War of American Independence," America's Library Web site (http://www.americaslibrary.gov/aa/madison/aa_madison_war_1.html retrieved, 6-6-11. ^ "Madison's Seventh Annual Message December 5, 1815 – Lance Banning, Liberty and Order: The First American Party Struggle ", in Lance Banning, ed., '"Liberty and Order: The First American Party Struggle" (Indianapolis: Liberty Fund, 2004). ^ a b c Banner (1974), p. 45. ^ a b Rutland (1990), p. 37. ^ a b Jennings, Paul (1865). A Colored Man's Reminiscences of James Madison. Brooklyn, NY: George C. Beadle. ^ Garry Wills, James Madison (2002), p. 163. ^ McCoy (1989), Last of the Fathers, p. 252. ^ "The Founding Fathers: A Brief Overview". The U.S. National Archives and Records Administration. Retrieved February 12, 2008. ^ Quinn, Michael, "Preserving a Legacy: Montpelier Will be Showcase for Madison", Richmond Times Dispatch, Dec. 5, 2004. ^ "Five Thousand Green Seal". The United States Treasury Bureau of Engraving and Printing. Retrieved September 17, 2008. Brant, Irving (1952). "James Madison and His Times". Broadwater, Jeff. James Madison: A Son of Virginia and a Founder of a Nation. Chapel Hill, NC: University of North Carolina Press, 2012. Cheney, Lynne. James Madison: A Life Reconsidered (New York: Viking, 2014) 564 pp. Rakove, Jack (2002). James Madison and the Creation of the American Republic (2nd ed.). New York: Longman. Rutland, Robert A. ed. James Madison and the American Nation, 1751–1836: An Encyclopedia (Simon & Schuster, 1994). Rutland, Robert A. James Madison: The Founding Father. New York: Macmillan Publishing Co., 1987. ISBN 978-0-02-927601-3. Wills, Garry (2002). James Madison. New York: Times Books. Short bio. Banning, Lance. Jefferson & Madison: Three Conversations from the Founding (Madison House, 1995). Banning, Lance. The Sacred Fire of Liberty: James Madison and the Founding of the Federal Republic (Cornell Univ. Press, 1995). online ACLS History e-Book. James M. Banner Jr. (1974). C. Vann Woodward, ed. Responses of the Presidents to Charges of Misconduct. Gabrielson, Teena, "James Madison's Psychology of Public Opinion," Political Research Quarterly, 62 (Sept. 2009), 431–44. Kernell, Samuel, ed. 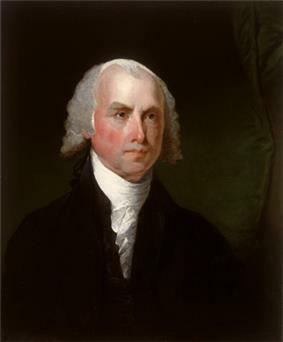 James Madison: the Theory and Practice of Republican Government (Stanford U. Press, 2003). Madison, James (1865). Letters & Other Writings Of James Madison Fourth President Of The United States (called the Congress edition ed.). J.B. Lippincott & Co.
Madison, James (1900–1910). Gaillard Hunt, ed., ed. The Writings of James Madison. G. P. Putnam's Sons. Madison, James (1962). William T. Hutchinson et al., eds., ed. The Papers of James Madison (30 volumes published and more planned ed.). Univ. of Chicago Press. Madison, James (1982). Jacob E. Cooke, ed., ed. The Federalist. Wesleyan Univ. Press. Madison, James (1995). Marvin Myers, ed., ed. Mind of the Founder: Sources of the Political Thought of James Madison. Univ. Press of New England. Madison, James (1995). James M. Smith, ed., ed. The Republic of Letters: The Correspondence Between Thomas Jefferson and James Madison, 1776–1826. W.W. Norton. Madison, James (1999). Jack N. Rakove ed., ed. James Madison, Writings. The James Madison Pamphlet Collection 283 pamphlets that originally belonged to James Madison available in the Rare Book and Special Collection Division at the Library of Congress.